If Purchasing Lots or Multiple Single Cards. Sleeves or Toploaders may have sharpie, stickers, or tape on them. 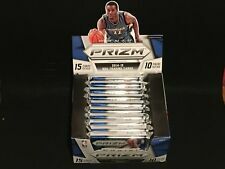 2016-17 Prizm Basketball - Cello Multi-Pack STARBURST Prizms, Silver Simmons RC? Possible to get highly sought after Parallels - Starburst Prizm, Green Prizm, or SILVER Prizm. Possible to pull BEN SIMMONS RCs! 2016-17 Panini Prizm Basketball. Possible Ben Simmons, Jaylen Brown, etc. autograph rookie cards, refractors, etc. JOEL EMBIID 2014-15 Panini Select ROOKIE ORANGE PRIZM #46/60 RARE RC 76ers . Condition is Like New. Shipped with USPS First Class Package. Pack fresh mint. This one should grade well. Possible Joel Embiid, Andrew Wiggins, etc. autograph rookie cards, refractors, etc. 10 Cards Redick Simmons Fultz Embiid. In my opinion the card is in nm/mt condition or better, see scan with zoom and judge for yourself. Any condition issues would be stated above. Any white specks in the scan is just dust on my scanner. 2013-14 Panini Prizm Silver Refractor Prizm - Jimmy Butler. Card listed in the title is NrMt-Mint condition. Very limited production. Only avl at the VIP Party by Panini. about 100 people were invited. only 200 made of each card. 2014 National Sports Collectors Convention 35th National in Cleveland July 30-August 3. see title for player. Joel Embiid 2014-15 Panini Hoops #6 Dreams Rookie RC Pack Fresh 76ers . Condition is Brand New. Shipped with USPS First Class Package. Okafor kaboom. Condition is Brand New. Shipped with USPS First Class Package. NERLENS NOEL - 76ERS. AMAZING CARD! THESE ARE RUMORED TO BE 5 OR LESS PRINTED PER PLAYER! 2018-19 Prizm NBA TEAM BAGS! BASE RWB, SILVER, GREEN, PURPLE, RED PRIZMS! Ben Simmons RC #7. More Panini Promo Cards available. Panini Instant opens up a new world and a unique opportunity. This is a VERY limited print run. This is on hand! Limited Print of only 50 cards made, Get yours now!